Camden Friends of the Earth played a vital role in opening an exemplar energy efficient house to the public during 2008. By helping to staff the house, in St Augustines Road, every Sunday over the summer months, we helped inform and inspire over 2000 visitors about different ways to save energy in their homes: solar thermal panels; photovoltaic electricity production; draught proofing; highly insulated walls, floor and roof; double glazing with highly efficient argon filled glass cavities and low emissivity glass; localised air heat recovery and a condensing gas boiler with good controls and insulated pipework. This house is part of Old Home Superhome project, an alliance of houses across the UK that have reduced their carbon footprint by at least 60%. More information at www.s-ea.org.uk. 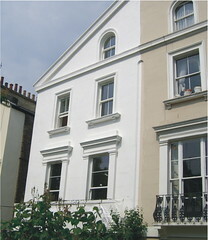 In 2010 Camden Council also retrofitted another Victorian home in Betram Street – see more on this Victorian eco-house on the council website. 27% of our emissions of CO2, the greenhouse gas mainly responsible for climate change, come from heating, lighting and powering our homes. It’s not glamorous but insulating walls and the loft could save you £200 a year. An even cheaper first step is to draught proof. 20% of all heat loss in a typical home is through ventilation and draughts. Read more about draught-busting workshops run by Transition Belsize in collaboration with Camden Council. A reduction of just 1 degree could cut your heating bills by up to 7.5% and save you about £60 a year. A thermostatic radiator control valve will allow you to finely control the heating in different rooms. … to keep warm on winter evenings and cool on hot summer days. Some TVs in standby mode use up to 85% of the power they use when switched on, and it would take 100 – 500 trees to absorb the CO2 emitted by a computer that does not get turned off. Washing at 60 degrees uses almost a third as much energy as a 40 degree wash. Modern washing powders work just as effectively at lower temperatures. Wait until you’ve got a full load before using your washing machine – using the ‘half load’ programme does not save you half the energy or water. UK households spend £1.6 billion every year on electricity to power their fridges and freezers. If everyone upgraded their fridges and freezers to Energy Saving Recommended ones, energy would be cut by two thirds, saving £900 million and the equivalent of the CO2 emissions of 600,000 homes. If all Europeans boiled just the water they needed, thus avoiding 1 litre of unnecessarily boiled water per day, the energy saved could power one third of Europe’s streetlights. Only boil as much water as you need, and de-scale your kettle regularly to make it more efficient. Just one energy-saving lightbulb can save you £65 over the lifetime of the bulb as they last up to 10 times longer than ordinary lightbulbs. Lights left on unnecessarily cost the UK £140 million a year! Make use of natural daylight whenever you can and turn lights off if you leave a room for more than a few minutes.